CAPONORD 1200 RALLY; DISTINCTIVE DESIGN: The overall shapes were drafted during the numerous wind tunnel sessions which led to finding a perfect balance between a highly compact form, optimum aerodynamic penetration and excellent protection from the wind. 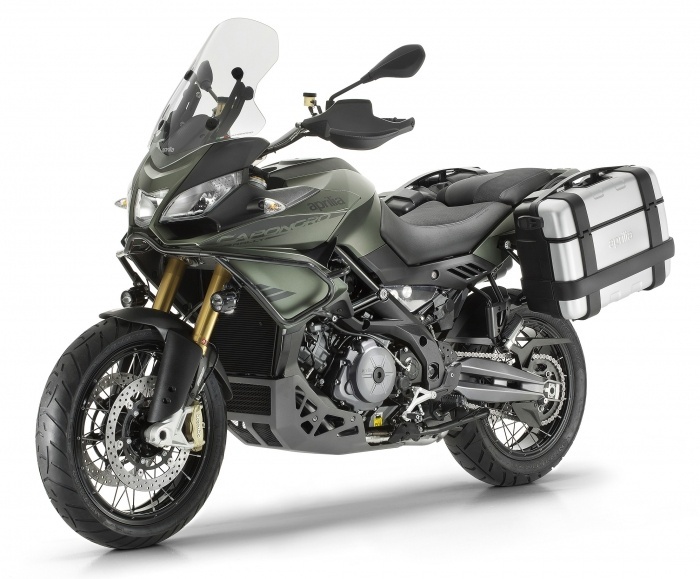 Guaranteeing maximum comfort for rider and passenger are the new oversized windshield which can be easily adjusted in height, the hand guards and the particular profiles of the sides, designed for minimum protrusion but protective at the same time. The adventurous style of the Aprilia Caponord 1200 Rally is completed by the new metallic tubular side guards and the brand new guard under the engine. The pair of supplementary LED lights is also new, contributing to an increase in riding safety, especially in low visibility conditions. One of the most important aspects for a bike dedicated to accompanying riders on the longest and most demanding trips is the riding position. Aprilia Caponord 1200 Rally provides riders of any height with an erect and relaxed position, the result of specific ergonomics studies in search of a dominant position that would not be tiring during long trips with perfect control over the bike and a sporty ride on road and in light offroad riding, even upright. The saddle has a particularly comfortable cushion and is just 840 mm off the ground, giving the rider total control over the vehicle when stopped. A lowered saddle is also available as an accessory to further reduce the distance from the ground. The passenger accommodations were also given particular attention: the portion of the saddle, large and flat, is separate from the rider's seat and shaped in such a way that prevents sliding forward, guaranteeing optimum comfort in any riding situation, while the ergonomic grab handles provide a firm and comfortable grip. “Rotational” technology allowed a thin walled nylon tank to be realised with great freedom of shape, favouring a reduction in weight. This way the lateral dimensions were reduced to a minimum and cater to the perfect leg position for the rider. The 24 litre capacity guarantees long range travel with a full tank. 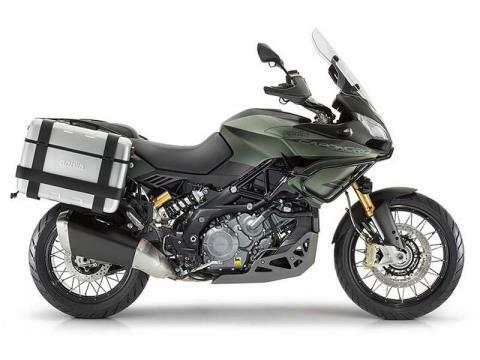 ENGINE; TWIN CYLINDER: The Aprilia Caponord 1200 Rally is powered by the latest evolution of the Aprilia V-twin already successfully installed in the Caponord 1200. The Italian V-twin cylinder boasts extremely advanced construction technology and a careful study of internal fluid dynamics aimed at improving combustion, decreasing friction, and maximising performance. The 1200cc Caponord Rally engine benefits from a series of improvements and refinements in terms of settings, timing and electronic control. 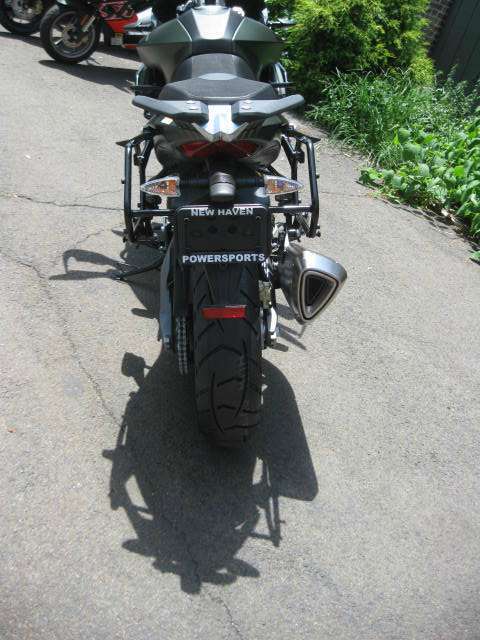 The natural developments of this twin which have taken place over time allow more progressive and responsive power output to be obtained even at low engine speeds (to the advantage of comfort) as well as enhancing riding pleasure thanks to high torque values, at the same time improving fuel economy. The Ride by Wire system dialogues perfectly with the engine ECU, managing the power in the best possible way at each point of the power output arc in order to have jerk-free manageability at low RPM, extreme responsiveness at medium RPM and exemplary spurts at high RPM. An efficient engine also provides the indisputable advantage of optimising fuel economy. 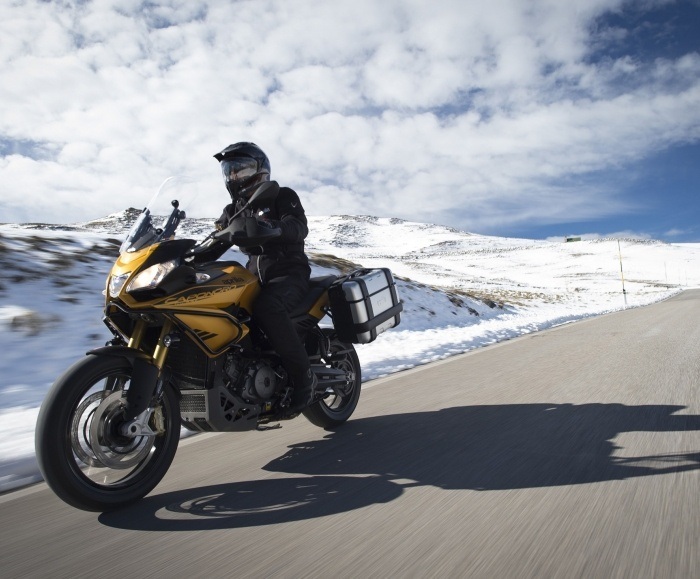 The triple mapping (Rain, Touring and Sport) that the rider can even select while riding, lets you have a bike with three distinct personalities, capable of instantly adapting to any possible condition and preference. 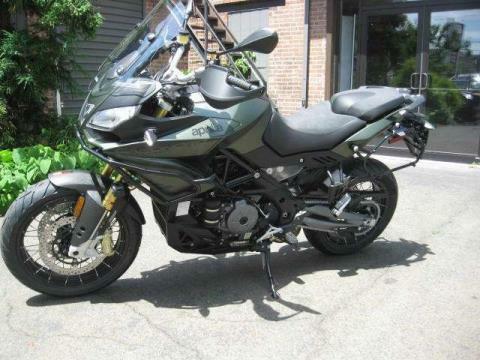 All the rider needs to do is close the throttle and press a button to choose the desired setting. 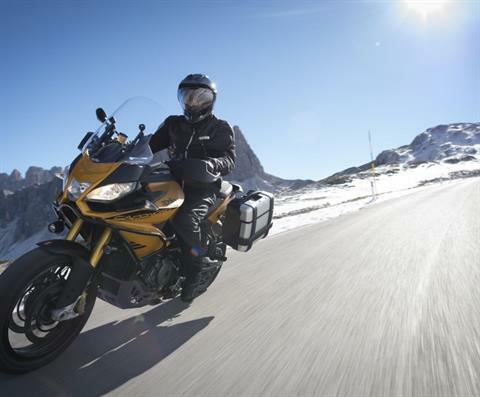 SPORT: maximum performance with responsive and direct power output, to satisfy a sporty riding style. 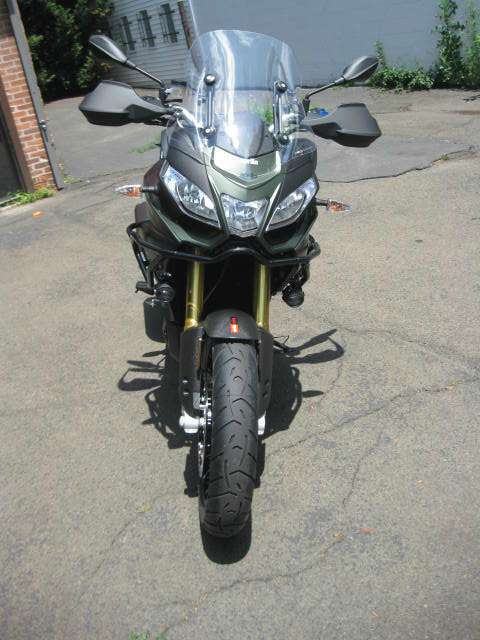 TOURING: the maximum power expressed is the same as the Sport mapping, but output becomes more fluid and suitable for daily riding or touring. RAIN: power is limited to 100 HP in order to guarantee maximum control and safety in conditions of poor grip. CHASSIS ARCHITECTURE; HANDLING AND STABILITY: The layout of the frame is a mixed structure, made up of a trellis in high resistance steel tubes connected to a pair of die cast aluminum plates. 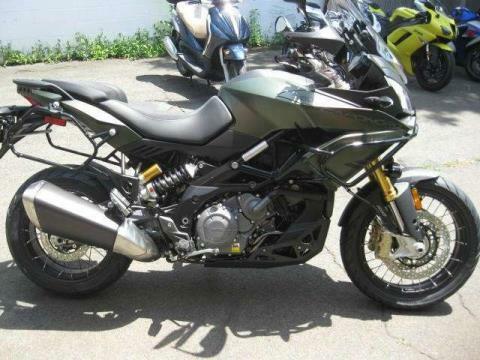 This exclusive and well tested configuration allows a perfect balance of weights to be achieved, as well as optimum torsional and longitudinal rigidity values, characteristics that give the Aprilia Caponord 1200 Rally standard-setting qualities for handling and stability at high speed. 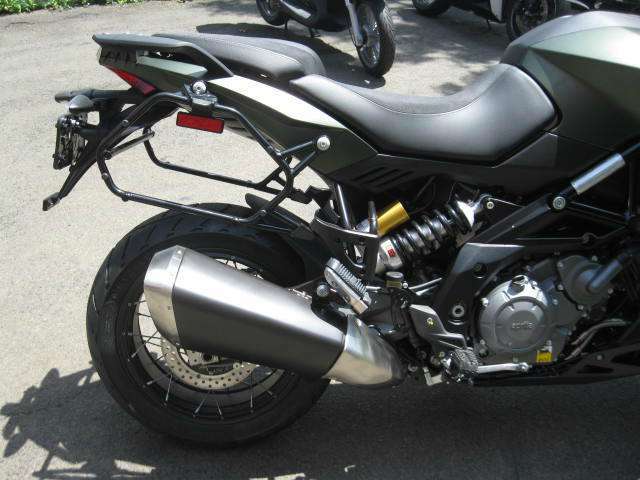 The new steel rear subframe ensures extreme solidity for trips with a full load, while the lateral positioning of the shock absorber, which connects the frame to the aluminum swingarm, is useful for providing the right amount of space for the exhaust manifold, leaving the unit far from heat sources in a position which favours any adjustments that may be required. The new spoked tubeless wheels – with 19 inches on the front – shod with versatile tires suited for any terrain that bring any destination within reach, no matter what type of road surface you need to tackle. ADD; MAXIMUM SOPHISTICATION AND RELIABILITY: ADD (Aprilia Dynamic Damping) is dynamic semi-active suspension system developed by Aprilia and protected by four patents, the reference point in motorcycling on a global level where technology, efficiency and reliability are concerned. Once again Aprilia has proven to be on the cutting edge of electronics applied to bikes thanks to a latest generation suspension system that manages to increase safety, comfort and riding pleasure. The ADD system measures the energy transmitted by bumps on the road surface to the bike and adjusts the hydraulic fork calibration and shock absorber in real time to minimise accelerations on the frame and consequently optimise comfort. To achieve maximum performance at any fork and shock absorber operating frequency, ADD uses a patented “comfort oriented” algorithm which combines the principles of the well known skyhook and acceleration driven damping algorithms. In addition to comfort, rideability is also enhanced and safety is increased thanks to further software strategies which are tied directly to the rider's actions. In fact, the system recognises the riding phases (acceleration, throttle release, braking, constant gas) and adjusts the basic fork and shock absorber settings thanks to yet another patent which allows specific hydraulic calibration curves to be defined within the adjustment range. The high precision of the system is entrusted to a selection of sensors which are derived from the automotive world and which, in addition to guaranteeing absolute reliability, allow the fork and shock absorber extension speed to be measured with maximum accuracy. In this field Aprilia has patented a unique solution for measuring the fork extension speed: using a pressure sensor. In the electromechanical calibration suspension systems already available on the market, the rider presses a button on the handlebar to activate an electric motor which changes the suspension set-up. In the Aprilia ADD dynamic semi-active suspension system, on the other hand, all the rider has to do is ride without any concerns of selecting one setting or another. 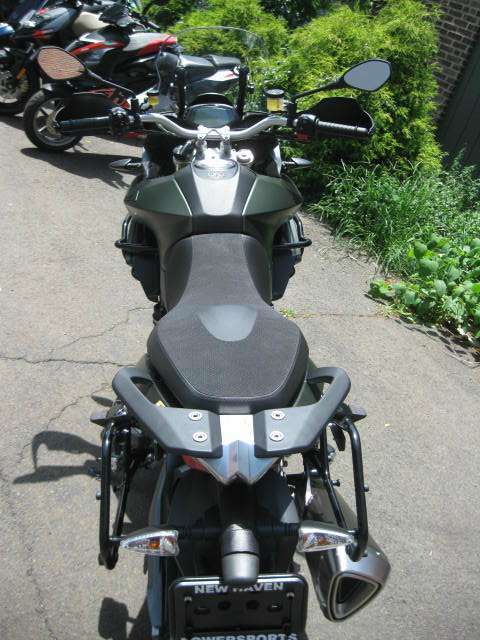 At the rear a built in piggy back shock absorber is used, electrically adjustable in spring preload to 4 predefined positions, indicated by specific icons on the digital instrument panel: rider only, rider with passenger, only rider with panniers and rider and passenger with panniers. 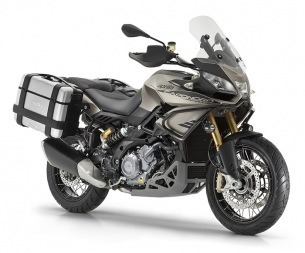 Aprilia system patented exclusive and then the automatic preload control mode for the spring. Once this option is selected the system is able to detect the bike's load by itself (weight of the fuel, rider, passenger, luggage, etc.) and automatically adjust preload to the optimum value for correct balancing of the bike. 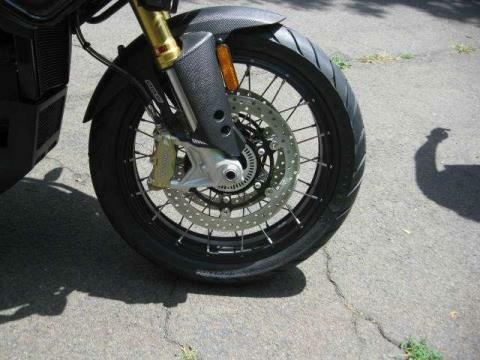 The ability of ADD to perfectly copy even the smallest imperfection of the road surface, thereby guaranteeing the best possible tyre grip, also allows the Aprilia Caponord 1200 Rally to achieve exceptional braking distances, unheard of on the competition's bikes. ABS and traction control (ATC) (which can both be disabled) are included as standard equipment on the Caponord 1200 Rally. 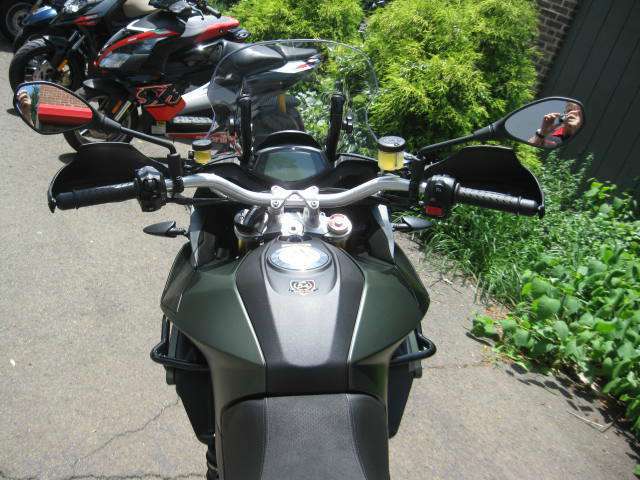 The two channel ABS system is specifically calibrated for the Aprilia Caponord 1200 Rally version. 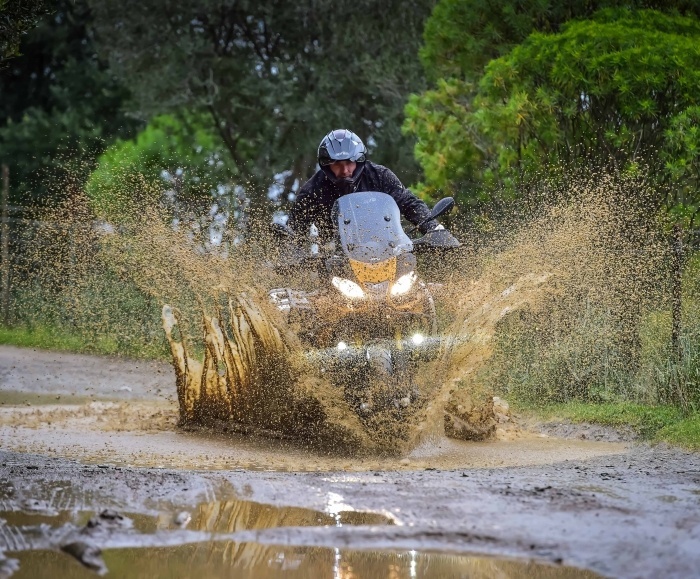 The particularly fine calibration allows the rider to make the most of chassis potential in sport riding, without ever being invasive, even in the most intense braking operations, whilst still guaranteeing maximum safety on slippery surfaces. 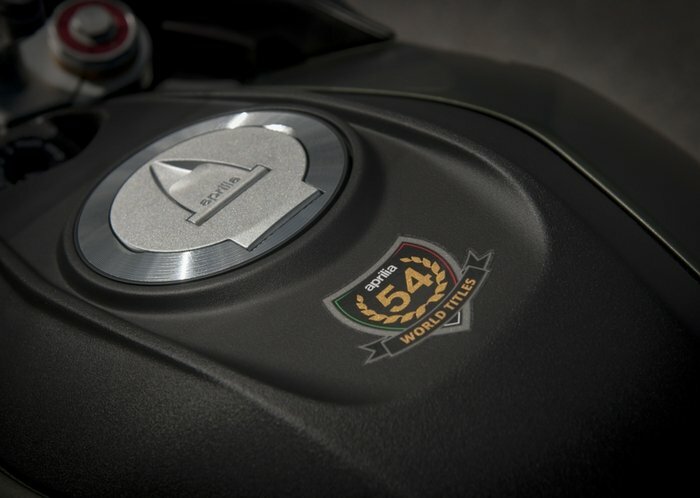 ATC (Aprilia Traction Control) is the exclusive patented traction control system derived from the Aprilia Performance Ride Control (aPRC) system on the extraordinary RSV4, designed and fine tuned by Aprilia to get maximum grip out of any type of surface, able to provide the rider with great riding confidence, simultaneously increasing safety. The 3 control settings, specifically calibrated for the demands of the Aprilia Caponord 1200, can be adjusted based on different riding styles and asphalt conditions: Level 1: for a pure sport riding experience, intended for good fun. Level 2: suitable for the city and touring and in general to manage the engine's performance on any route. Level 3: ideal for safety taking on difficult situations such as low grip surfaces, staying in complete control. Aprilia Cruise Control allows the desired speed to be set and maintained even on uphills and downhills, without touching the throttle control. The system disengages automatically if the rider touches any of the brake/clutch Cruise Control commands and is very useful on long motorway routes because it helps save fuel and makes the ride less tiring. 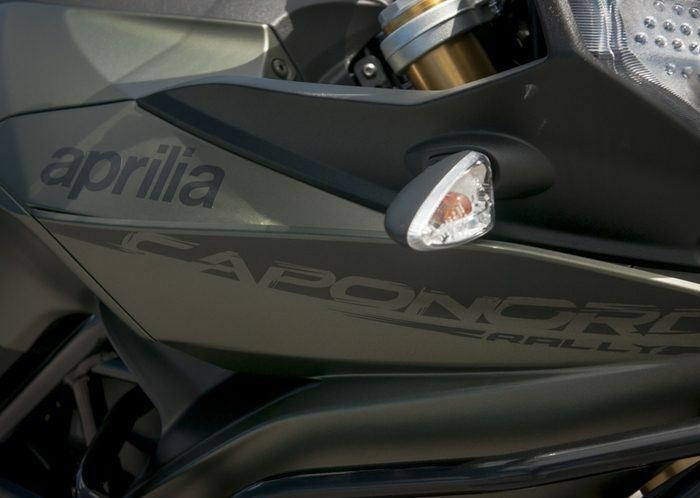 The instrument panel that equips the Caponord 1200 Rally is fully digital: The full LCD combines the speedometer, rev counter, total and two trip odometers, fuel level and coolant temperature. There is also a selected mapping indicator (S,T,R) as well as the shock absorber electric spring preload indicator. The engaged gear is also indicated, as well as the ATC level adjustment and heated hand grip operation (available as a separate option). The range of indicator lights on the side includes the fuel reserve warning light and the ABS, ATC and ACC activation/deactivation indicators.